So you have your nice new WordPress website all up and running. You’ve been blogging for a few months now, your growing audience loves your content, but then one day the unthinkable happens. You accidentally deleted a crucial file or setting and the website is no longer working. You do have a backup right? There are a range of solutions available today for backing up WordPress. At Pechrian Digital, we recommend the UpdraftPlus plugin. It’s 5-star rated, and it’s easy to setup, and even allows backups to be sent directly to your Dropbox folder. And it’s completely free! 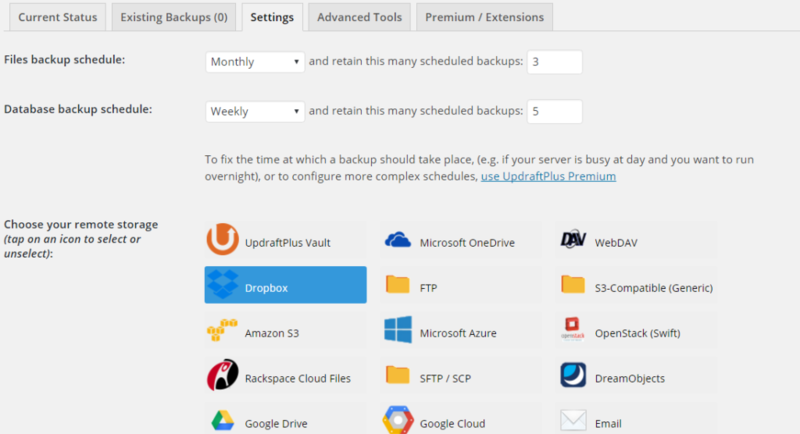 In this tutorial, we’re going to go through the steps on installing UpdraftPlus, and link it to Dropbox, so that your backups are safe and secure. To install the UpdraftPlus plugin, log into your WordPress back-end, and select the Plugins section from the left hand side. Click Add New, and search for “updraft”. You can then install the plugin by clicking the Install Now button. In the screenshot below, it’s the plugin on the right with the orange logo. Once activated, you should see a new UpdraftPlus option appear at the top of the page in your admin bar. If the only copy of your website backup resides on your website itself, then it’s of little use if there’s a problem at your web hosting company and you can’t get access to it! So it’s essential that your backups get saved somewhere else, and this is where Dropbox comes in. 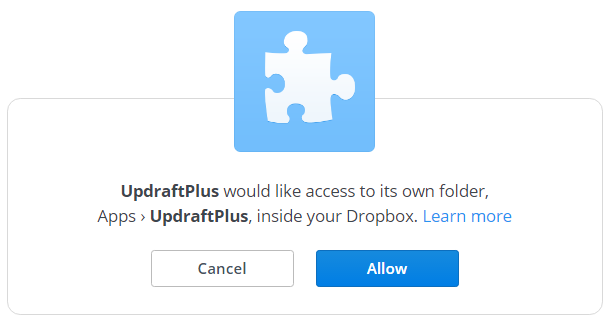 One of the great features of UpdraftPlus is that it can be linked to your Dropbox account. If you don’t already have Dropbox, or some other cloud storage, then it’s highly recommended. Like all cloud storage services, you get quite a lot of storage for free. Although Google Drive is also supported, it’s a bit more technical in setting up, so for this tutorial we’ll assume you’re using Dropbox. Other cloud storage options are also supported such as Microsoft OneDrive, but they’re paid extras. The first step in linking UpdraftPlus to Dropbox, is to first log into your Dropbox account on another browser tab. Make sure you’re logged in and can see your files. This is essential for the next step to work. Back in the Updraft Settings, select Dropbox from the remote storage options. You can also set how often backups get run, and how many backups are kept. For the Files backup schedule, we recommend Monthly with 3 backups, and for the Database backup schedule, choose Weekly with 5 backups. You then need to click Save Changes at the bottom of the page. Once that’s done, scroll back about halfway to the “Authenticate with Dropbox” section, and click the link as shown below. UpdraftPlus then communicates with your logged in Dropbox account, and asks for permission to automatically upload files every time a backup is completed. Click the Allow button to continue. Click the Save Changes button at the bottom again. And that’s it! Each time your website is backed up, UpdraftPlus will automatically upload the backup files to Apps – UpdraftPlus in your Dropbox folder. I’m sure you’ll agree, that having a backup plan is place is essential and gives you complete peace of mind. After all, over time, you’ll produce a lot of valuable content, which you simply cannot afford to lose. As always, any feedback on our articles is always welcome. So feel free to drop us a line.